We are very excited and proud of the mural that Jade Rivera has been working on in Jaco. As long time fans of his work, it is a dream come true to have him create one of his original artworks on a wall in our beach town. Jade has also been telling us how he is really enjoying Jaco, even though his race against the weather has been somewhat challenging. Today, for example, it was down pouring in Jaco this morning which puts a slight delay in the painting schedule, but he has been diligently working through the challenges. Although taking a little break because of the weather has allowed him to take in some sights like the beach in Esterillos, Tortuga Island, and the Tres Piscina waterfalls in Parrita. And let’s just say he is a little enchanted with our quaint beach town! Especially with how green everything is this time of year. The progress of the mural in just one week has been incredibly fast! Normally, most artists might take a month to finish a work of this scale. There are only a few artists around the world who would take on a task this large and be able to complete it so quickly. Jade also had an offer to travel to paint in a Street Art Festival in Canada this month, but lucky for us he and his wife picked Costa Rica for their next adventure. Thanks for staying up to date with news from ARTIFY JACO. Follow us on Facebook & Instagram to stay informed about the progress for the Jade Rivera mural and…. Farid Rueda will be in Jaco end of July to begin his work! This past weekend we completed a NEW mural in our community! Kamel from the Boruca tribe created an amazing mural in his traditional style, featuring a jaguar, frog and eagle. 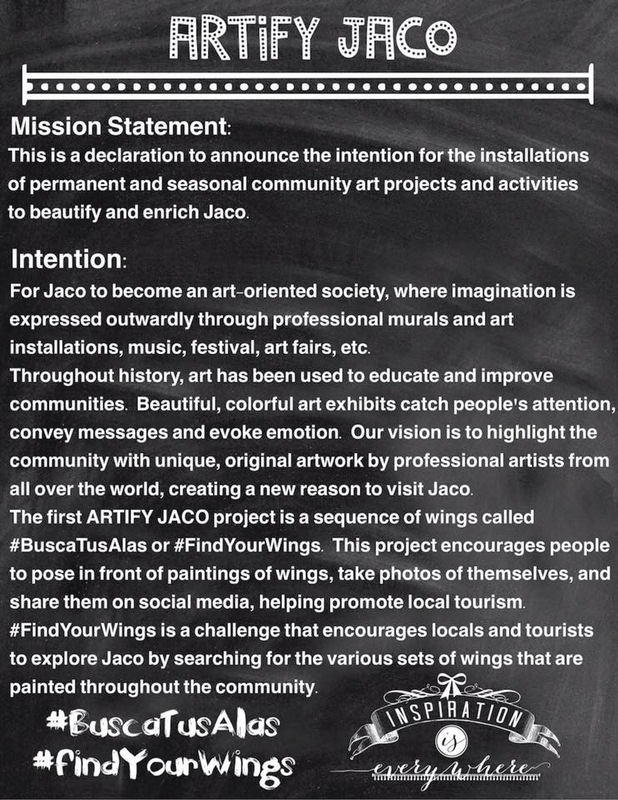 This coming July we have 2 internationally recognized artists coming to Jaco to do large-scale murals in our town! We couldn’t be more excited. The theme for all the current murals is: ART. LOVE. NATURE. Raising consciousness of Nature through Art. July 10, Jade Rivera of Peru @riverajade (FB link) will bring his incredible talent to Jaco. His work transports us to a world of subtle mystics and fantastic illusion, celebrating man’s relationship to nature. It is surreal & ephemeral. Later in the month, July 25th, we have Farid Rueda. 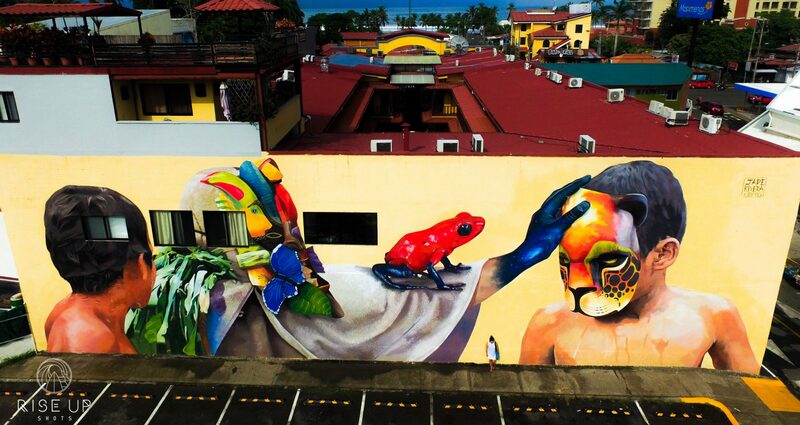 @farid.rueda (FB LINK) From the birthplace of Muralism; this Mexican artist has made a name for himself internationally. He is currently touring and installing large paintings on the streets of Europe. His murals can be described as contemporary figures from the natural world, with design elements rooted in an ancestral Mexican aesthetic. ¡El pasado fin de semana terminamos un NUEVO mural en nuestra comunidad! Kamel de la tribu Boruca creó un mural increíble en su estilo tradicional, con un jaguar, una rana y un águila. ¡En el próximo mes de julio tenemos a 2 artistas internacionalmente reconocidos que vienen a Jaco a hacer grandes murales en nuestra ciudad! No podríamos estar más emocionados. El tema de todos los murales actuales es: ART. AMOR. NATURALEZA. Elevar la conciencia de la Naturaleza a través del Arte. Julio 10, Jade Rivera del Perú @riverajade (FB link) traerá su increíble talento a Jaco. Su obra nos transporta a un mundo de místicos sutiles y ilusión fantástica, celebrando la relación del hombre con la naturaleza. Es surrealista y efímera. Más tarde en el mes, 25 de julio, tenemos Farid Rueda. @ Farid.rueda (FB LINK) Desde el lugar de nacimiento del Muralismo; Este artista mexicano se ha hecho un nombre internacional. Actualmente está recorriendo e instalando grandes pinturas en las calles de Europa. Sus murales pueden ser descritos como figuras contemporáneas del mundo natural, con elementos de diseño arraigados en una ancestral estética mexicana. In Jaco, this weekend we were lucky enough to have Boruca tribe member and artist, “Kamel” Melvin Gonzalez, visiting to paint a mural on a wall in town and to share some of his culture with us. Melvin prefers to be called by his traditional name Kamel, is 38 years old, and is working hard to help keep the Boruca roots and traditions alive through his paintings, mask making, and by giving inspired presentations on history and culture from his tribe. Melvin at such a young age is considered one of his tribe’s leaders and is helping to pave the way for his people’s future. In the 1980’s Kamel’s father, Ismael Gonzalez (pictured above), realized that the culture of his people was slipping away. He began working with the young boys of the community, teaching them how to carve masks and carry on the Boruca traditions. He founded an artisanal workshop for his town that would transmit ancestral knowledge on to the new generations. Ismael received several awards for his efforts to rescue the arts & mask making culture of the Boruca people including the Premio Nacional de Cultura Tradicional, the Premio Magon, as well as receiving recognition for his work towards the conservation of his people’s environment. Ismael Gonzalez was deemed a living human treasure before he passed away in 2014 at the age of 86. Kamel says that his inspiration comes from his elder male influences of the Boruca village Including his Uncle Nemesio who is 88 years old. The elders taught him that everything in life is connected on a spiritual level. They taught him the legends of the spirit world including the energies and nymphs of the mountains, waterfalls, lagunas and oceans. Because of these teachings he has a deep respect for nature, which is represented brilliantly through his art. Sadly for the Boruca people, they have experienced the loss of many of their elders in the past 2 years, leaving many of the younger men in charge of cultural relations and keeping their heritage alive. Kamel, following in his father’s footsteps, is one who has taken on the task. As he happily told me after he finished his work, “El arte se traduce bien a todo tipo de personas.” Art translates well to all types of people. Artify Jaco is an organization that has been working with artists to promote street art and artistic expression in Jaco. We feel honored to have had Kamel in town for the weekend to share with us and leave his mark in Jaco. The mural is located in central Jaco, just to the right of Tico Pod Art House & Pizza Pata, next to Jaco Fine Meats. Art works by Kamel Melvin Gonzalez can be purchased in Tico Pod.